To understand the concept of Revenue Cycle Management. To understand the processes of Revenue Cycle Management in Hospital Management and its importance and implications. 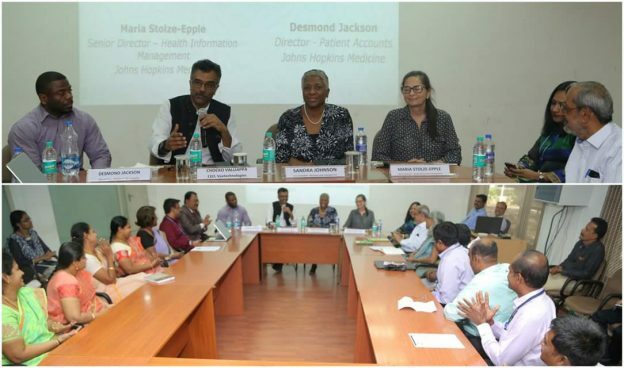 To know the difference between the Hospitals being managed in India and the US. The Principal, Director-Academics and Senior Dean of Sona College of Technology. 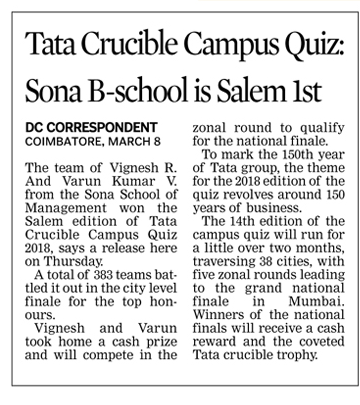 Faculty of Sona School of Management along with 30 of their students. And seven staffs from M/s.Veetechnologies. Johns Hopkins Medicine (JHM), headquartered in Baltimore, Maryland, is an $8 billion integrated global health enterprise and one of the leading health care systems in the United States. Johns Hopkins Medicine unites physicians and scientists of the Johns Hopkins University School of Medicine with the health professionals and facilities of The Johns Hopkins Hospital and Health System. The three guests has given their consent during their business visit to India and was channelized by our Vice-Chairman Mr. Chocko Valliappa. Mr. Chocko Valliappa introduced Sona School of Management to the Guests and welcomed the Guests with a brief introduction about them. He then invited Ms. Sandra Johnson and others to address the gathering. Ms. Sandra in her speech explained about the whole revenue cycle management process and its importance. The speech revolved around how Johns Hopkins hospitals takes care of patients and their records. She explained about the billing process, the collection cycle and the intricacies in dealing with insurance agencies and government. Also the organizational structure with its chain of command was touched upon. And how different processes are decentralized and centralized to facilitate ease process flow. Followed by Ms. Maria stolze explained on the data entry and coding of data enabling the medical record documentation part. She spoked about how different people utilize the patients data being entered. Mr. Desmond Jackson explained about different data being processed and the final record maintenance and its characteristics. There was a great interaction after the Guest speeches. MBA students enthusiastically asked several Questions along with faculty of Sona and staff members from Veetechnologies. Students were curious to understand the differences between India and the US in terms of employee’s nature of working, the processes in running hospitals. A few of questions on logistic operations, value creation, benchmarking done in revenue cycle, operations during emergency and disasters are well taken. 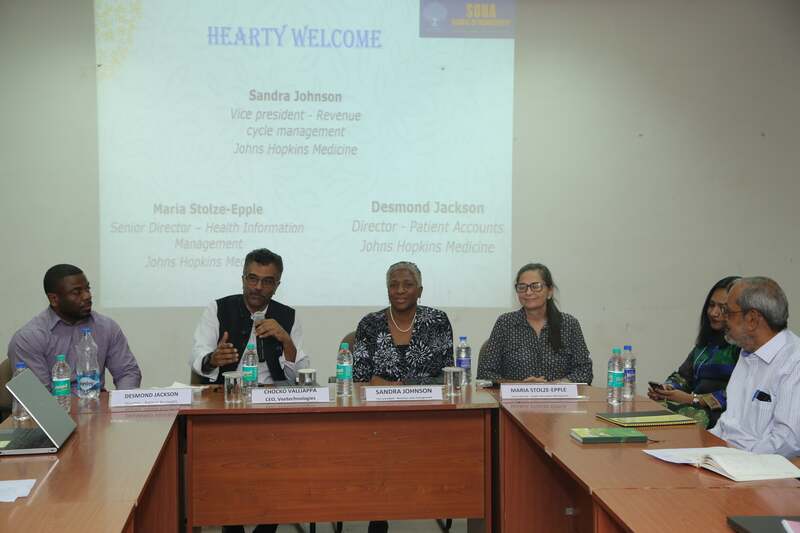 The programme clarified the conceptual meaning and implementation of Revenue Cycle Management in Hospital management. The Programme gave an insight to read more and involve the perspective of Revenue Cycle Management in the MBA curriculam and Research. The participants expressed their happiness in terms of gaining new knowledge and the interactions (esp. students’) happened during the programme. The guest speakers, the Principal, Director-Academics, senior dean expressed their happiness and appreciation for the programme. We would like to thank our Director Prof. Swarup K Mohanty for his strategic intent, teaming and direction for making it a success. 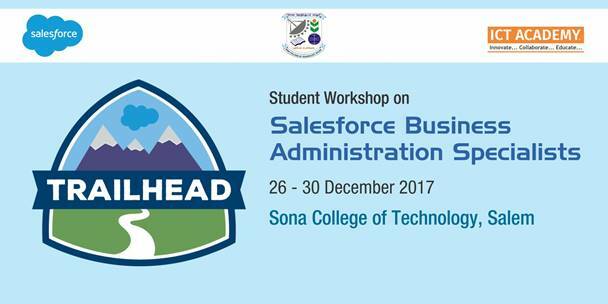 This entry was posted in Uncategorized and tagged JohnsHopkins, Revenue Cycle Management, SSoM on March 3, 2018 by Kamal P.
Sona School of Management organizes two day International Conference on Future work organizations: Perspectives Issues and Challenges on 29th to 30th December 2017 at Goa University, Goa. Prof. S.P. Thenmozhi, convener of the conference welcomed the delegates from 9 foreign countries and 17 states of India. 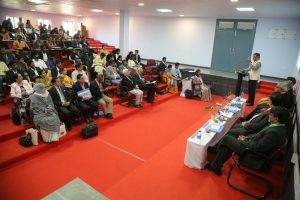 The conference was inaugurated by Mr. Chocko Valliappa, founder and CEO- Vee Technologies, Bengaluru and Vice Chairman Sona Group of Institutions. He spoke on the way the technology and innovation has led to disappearance of the jobs like the drivers, tellers, typists and the revolution it has created in the automobile industry, health sector, space management, waste management, water management etc. He discussed the changing phase from dependent managers to independent managers and now moving to interdependent managers in future. 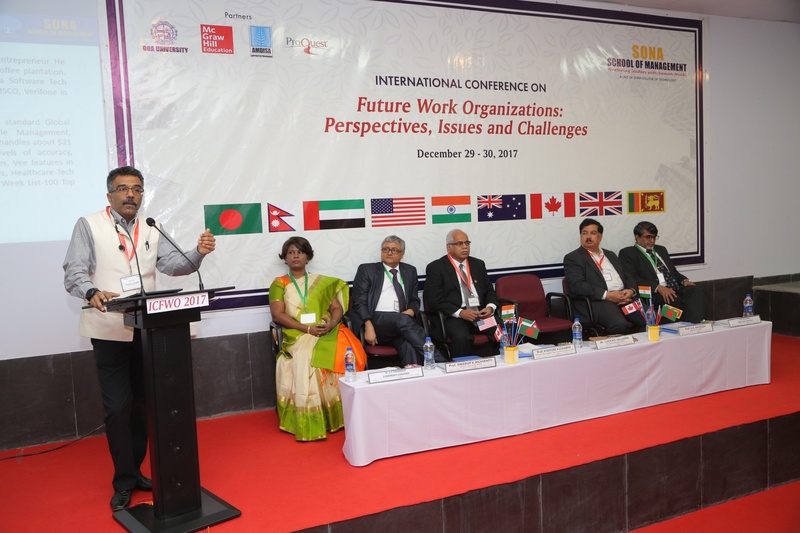 Prof. Swarup K. Mohanty, Conference Director explained the conference theme and briefed on the need to blend technology, leadership and workforce for the future organisations. Prof. Kishore Kulkarni from Metropolitan State University delivered the key note address. 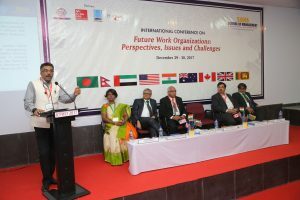 He enlightened the participants on the economic challenges and economic recession that is likely to happen with technological developments and leading to future work organizations. Prof. K.B. 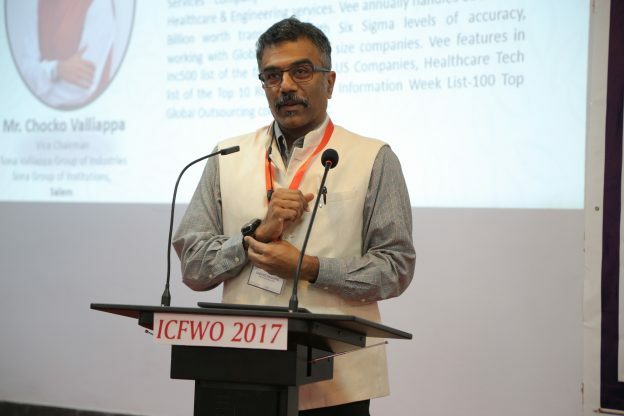 Akilesh, Senior professor, IIsc, Bengaluru, in his address told that the emerging industries would require new, jobs, skills and competencies which would differ from that of the existing ones. The exploration of such skill sets and developing the competencies for human workforce is the need of the day. An MOU was signed between Sona College of Technology and Daffodils University. 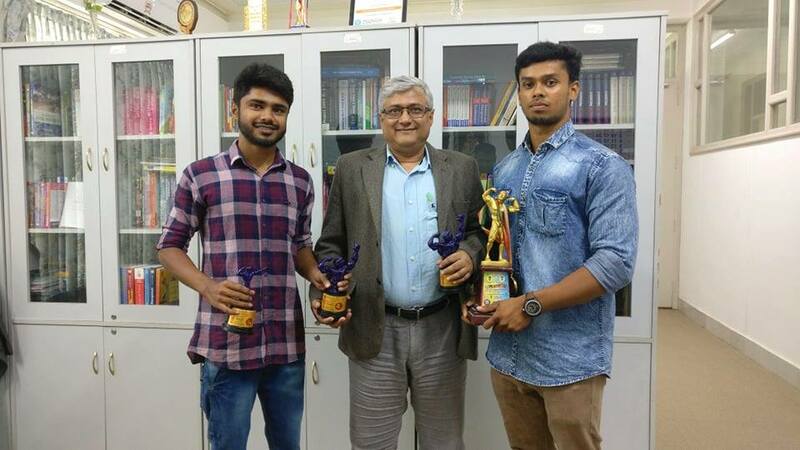 Mr. Chocko Valliappa, Vice Chairman, Sona College of Technology, Salem and Sabur Khan, Chairman, Daffodils University exchanged the MOU and the flags. 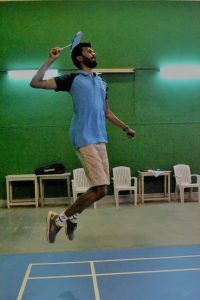 This entry was posted in Uncategorized and tagged Goa University, ICFWO 2017, SSoM on December 29, 2017 by Kamal P.
BIT COIN: Evolution or Speculation? Money is always been a matter of at most interest for mankind. From medium of exchange to holding wealth, currencies have played a crucial role in the evolution of economic system. Interaction between demand and supply of a currency decides its value, which is basically controlled by government through a country’s central bank. 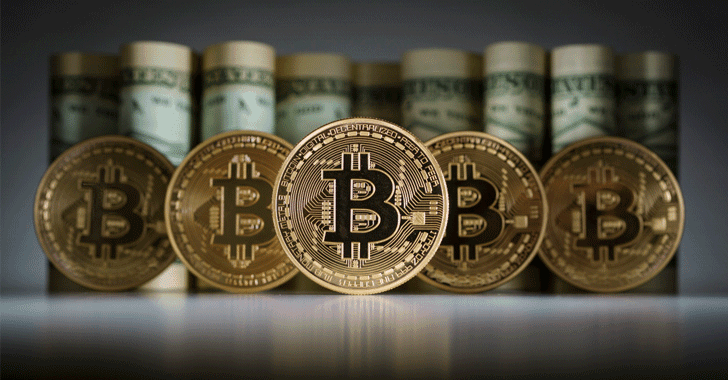 But in the era of internet and technologies and when the government itself speaks about cashless economy to counter the black currency and black economy, it is quite natural that people will bring into to shape for an innovative method of monetary system which alternates physical currencies. That’s how crypto currencies came in to place. This entry was posted in Uncategorized on December 29, 2017 by riyaz ahmed. One can think of a healthy mind only with a healthy body. Both physical and mental wellbeing are the prerequisites for a person to achieve great things in life. Bodily health is essential for ‘hard work’, which is the only road to get success in ones’ personal and professional life. An unhealthy man always feels weakness, losing confidence and hence he becomes very dull and inactive. So to keep ourselves healthy, one must take an active interest in sports. Sports plays an essential role in everyone’s life. That’s why Sona School of management (SSoM) has a great infrastructure which supports students to take part in physical activity. As a sportsmen I felt very satisfied with the facilities of the Sona Sports complex. Through Sona’s sports support we have improved a lot in this two months of stay in our SSoM campus. This entry was posted in Uncategorized on December 22, 2017 by riyaz ahmed.